Tonight police and Civil Aviation Authorities are trying to determine the origins and destination of a mystery plane that had a crash landing west of Spanish Lookout early this morning in an area known as Green Hills. Police have confirmed that the plane, believed to be a Cessna 210 single engine crash landed on an abandoned road two and a half miles from the Guatemalan border. It is believed to have attempted a landing on the dirt road, and then ran off the road. After that, the occupants are believed to have deliberately set it on fire and then fled. There are no signs that anyone was seriously hurt. But really there are no signs of anything! There are also no identifiable marks on the plane, no cargo, no id's, no nothing, because it was completely destroyed by fire - save for the tail section. Because of the fact that it was attempting to land in the pre-dawn hours, and that it was deliberately destroyed, the suspicion is that it was a drug plane, and the illicit cargo was removed. The Civil Aviation Department has deployed a team to investigate, but because no flight plan was filed, and no marks are visible they have handed the investigation over to police. The police Mobile Interdiction Team has been deployed to an area is remote and out of range. Random appearances of suspect, damage planes have occurred previously, but mostly in the Orange Walk and Corozal Districts. The Belize Police Department has issued some information on the wreckage of a small plane that was found near Spanish Lookout on Tuesday morning. Authorities say that the aircraft was a Cessna 6-seater. While initially it was thought that the plane crash-landed, police say their initial investigation reveals that the plane was used to transport illegal drugs. That would suggest, according to one source, that the plane may have landed, and then deliberately set on fire. 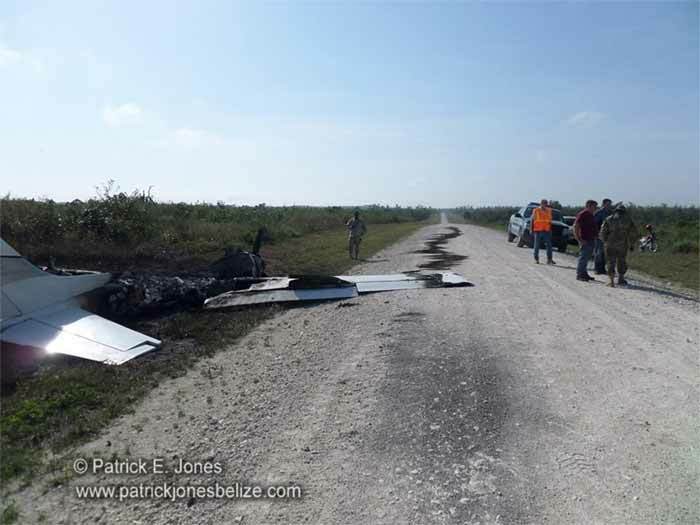 Pictures from the scene show that most of the aircraft was destroyed and only the tail section and a portion of the wings which did not burn remained. The remains of the plane were located by authorities on a feeder road in an area north of Spanish Lookout near the Aguacate Lagoon. The Civil Aviation Department is assisting with the ongoing investigation of the illegal aircraft landing in the Spanish Lookout area. As for the illicit cargo which the police believe was in the plane, authorities have not said if they know where it was taken.